Hi speed clamps available separately. Available in normal black steel or stainless steel. 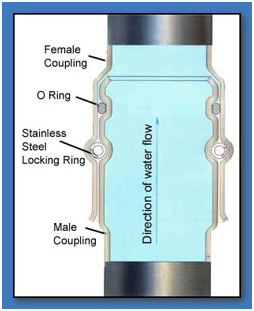 The system consists of a male and female connector with a polished spring to guarantee the locking position. The 0-ring makes the system water tight. An installation depth of 300 meters is guaranteed and the installation will not twist on startup. Turn three days into 3 hours. 2″ installations – install 200m in 1 hour. The pipe can take pressures up to 40 bar, and the tested pressure is 100 bar. The couplings have a relatively small outside diameters which are none corrosive. 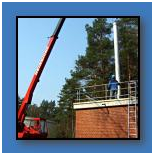 It is a light, secure and practical way of installing borehole pump units. It is just as simple to remove the pump if necessary. The push-on coupling pipes are available in 6m and 3m lengths. Compromising lengths are available in 2m and 1m. Please note that there is a difference between the installed length and the delivered length of pipe, e.g. installed length 6 meters, delivered length 5.92 meters. 1) The water gets drained completely out of the pipe so there is no water in the connection. 2) The water gushes inside the pipe from the male to the female resulting in a secure connection. 3) With this system the silting up of the connection (adapters) is prevented, even for long term installations. 4) Minimal corrosion is possible. 5) Minimal growth of bacteria.